Enter and maintain the text that serves as a template for employee emails and contracts. Enter the Effective Date when the text should start to be used. Enter a Subject if the text will be used in an email. This will appear as the subject of the email the employee receives. Enter the Body of Text. 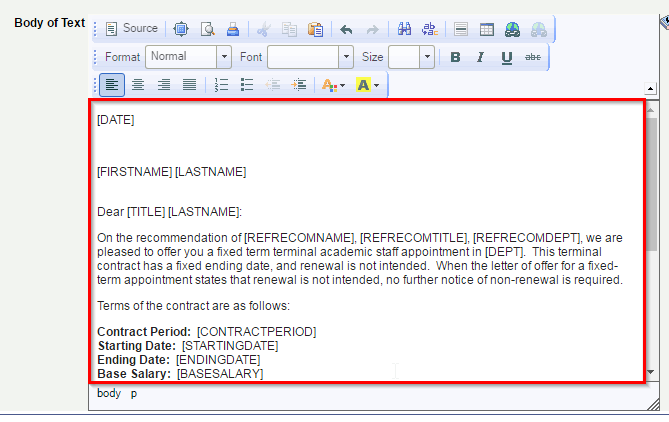 The text will appear in the email or contract as it is entered, except any placeholders will be replaced with the corresponding information for the specific employee. Placeholders indicate where in the text information for each employee should be placed when the email or contract is prepared and sent. All placeholders must be in upper case and enclosed in square brackets. [AMENDED] Flag in bold text on the contract that indicates it has been amended. - If this placeholder is alone in a separate paragraph, the whole paragraph will be removed if it is blank. In all placeholders for a person in the refer list, refer indicates where the Refer Type code must be. If RECOM was the code for a recommender and SUPVR was the code for a supervisor, then [REFRECOMNAME] would be the place holder for the recommender's name and [REFSUPVRNAME] for the supervisor's name.